Of course, Denver had the worst cold of the year on November 12th. It was brutal. So brutal, getting a cab took at least an hour. Uber. Forget it. They never even sent the text they promised…. “5 to 7” was a good choice for opening night. It was pleasant to look at, the characters were beautiful and viewers got a taste for the complex tradition of the French, a la Nicolas Sarkozy and Carla Bruni. Seems that it’s perfectly ok to have a lover, husband, wife, children, upper East Side apartment, diplomat husband, dinner parties with well-known actors and politicos attending, as your lover chats across the table with your husband’s lover. No word on how to accomplish the serious business of mapping seating arrangements. Can you imagine strategically planning for family, friends and everyone’s lovers at the dinner table. Never mind. This movie is about the hours of 5 to 7 p.m. when love takes place. And it’s not at the dinner table. “5 to 7” wasn’t highly intellectual. It was, for me, unrealistic. Really. A young journalist/writer makes eye contact with a knock out, beautiful ‘older’ woman (French and rich to boot) outside the St. Regis Hotel and soon finds himself on her daily love schedule – 5 to 7 p.m. at the Carlisle Hotel in Manhattan. What male wouldn’t jump on that? Who could be so lucky? Unknown actors Anton Yelchin (plays Brian) and Berenice Marlohe (Arielle) play the two unlikely lovers. I never bought the story line but, I did buy that Brian was in love with Arielle and it was the truest and most powerful love of his young life. Maybe his entire life. What is believable and the highlight of the movie were seasoned actors Glenn Close and Frank Langella who played Brian’s parents. Talk about a new duo who could carry an entire movie. I say someone needs to see the chemistry in these two professional actors who have a strong appealing comedic talent. I found Close and Langella delightful and wanted more of their interactions with each other and every one in the movie. 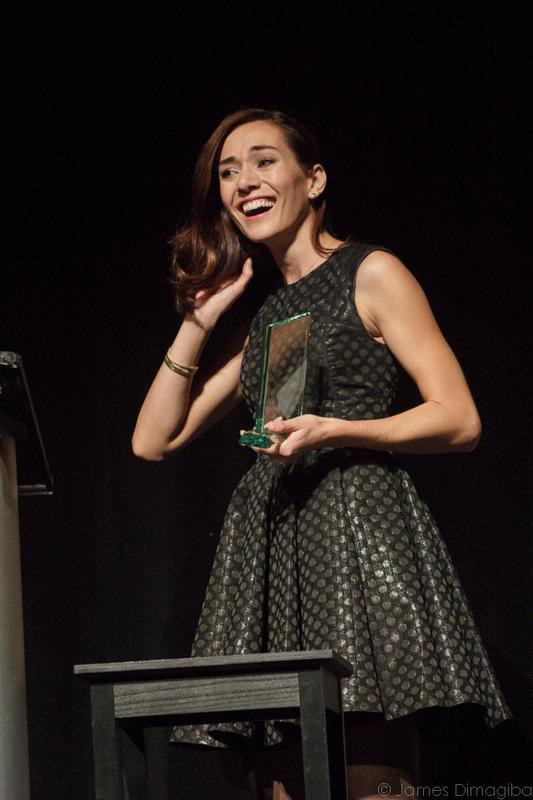 Jocelyn deBoer received the SDFF Rising Star Award for her portrayal of Mr. Diplomat’s (Arielle’s husband) lover. 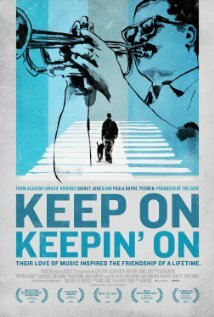 “Keep On Keepin’ On,” is a documentary following four years in the life of jazz great Clark “CT” Terry. There was a screening last week, and it was shown November 13th at the UA Pavillions. If you missed both, it opens on December 5th, theatrically at the Sie FilmCenter. Not to be missed this time around. This is the documentary that lives and so does Clark Terry. At 93 years old, he’s living in Arkansas and continues to mentor young musicians. The story centers on his student, Justin Kauflin, who has formed a life-long bond with the jazz legend. Kauflin, himself, is a phenomenal pianists who happens to be blind. Terry, suffering the effects of diabetes, is also losing his eyesight, bringing the two together on more than a musical level. The historic footage of Terry, Dizzy Gillespie, Duke Ellington and Quincy Jones (as a young musician) is breathtaking. Many local musicians know the name Clark Terry. Most of us after seeing Keep on Keepin’ on, will never forget Clark Terry. It brings us non-musicians into the realm of one of the all time great musicians who was the creator of the ‘doodle tongue system,’ and without a doubt, a true artist. It was said that with every note Clark played, “You could hear his life through his trumpet.” I did. His talent is one thing. His soul is another. A must-see.